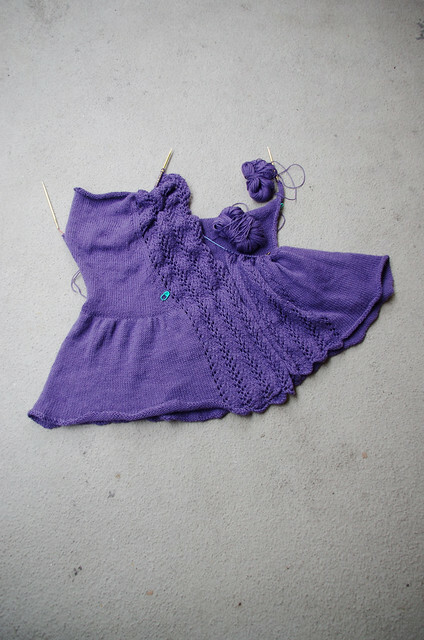 So this rather twisty mess is the Provence Cardigan, which I started back in July. 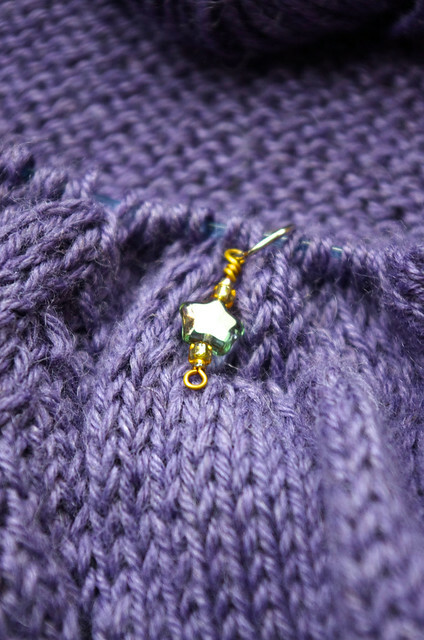 It's on two circular needles with two different balls of yarn attached, so it gets pretty tangled in my bag! 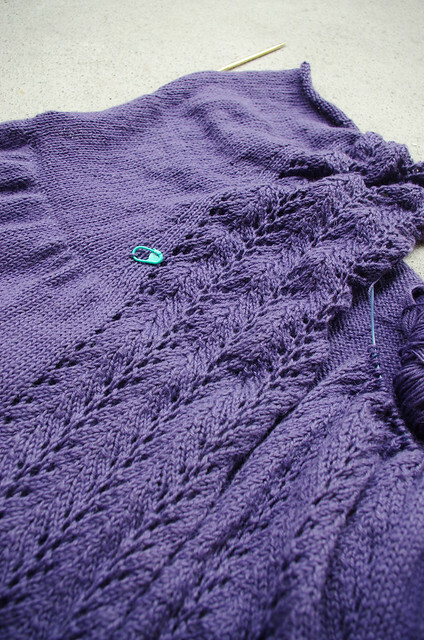 After knitting the skirt section of the cardigan, I got distracted by shawls and other, more pressing projects - as one does - and dropped it for a few months. After the last shawl I cast on last week was giving me problems, I decided to grab a project that was already in progress. And since then, I've knit all of the right front and a big piece of the back. I'm hoping that I can keep the momentum going and finish it up in the next month or so, but we'll see how that goes. I'm still really enjoying the yarn, which is Classic Elite Soft Linen. It's got linen and alpaca in it, so it has the crispness of linen, with softness and just a touch of bounce-back (at least, more than a plant fiber!) from the alpaca. 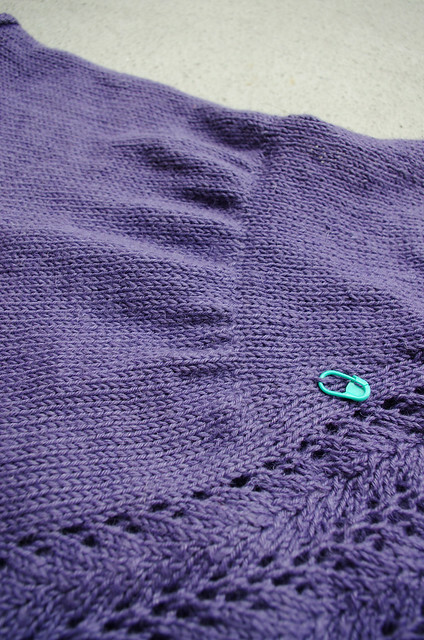 I washed and blocked the skirt of the cardigan before continuing on to the upper bodice, and the resulting fabric is soft and drapey, so I'm really excited to see what the finished product looks like. In other news, last night at school, I had the presentation of my lookbook, moodboard and technical board for my collection, and it went really, really well! 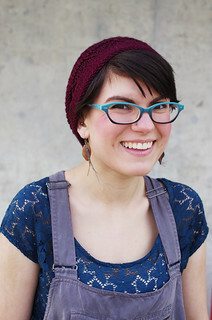 I felt like I had a really clear idea of who my customer is, what materials I'm using, and how I'm going to price my garments, so in the end I felt very ready to talk about it in front of a bunch of people. Although I started off a little jittery, about a third of the way into the presentation, I finally calmed down a bit and felt much more at ease in front of the audience. By the end I was feeling pretty great about my performance, so I was able to close on a strong note. I usually get really stressed out and shaky during presentations, so that was a pleasant surprise! There were three of us presenting, and we all have very different aesthetics and customer bases, so it was really interesting to see my classmates' presentations as well. I was really proud of our class - we all worked really hard, and I think it showed. I can't wait to see the looks walk the runway! Storyboard class is a big hurdle in my program, so it feels great to have it done. In celebration, this afternoon I'm going to hunker down, knit, and watch Project Runway. Hurrah! Congratulations on making it through your presentation - I'm excited to see the garments. I've been wanting to try that linen/alpaca blend yarn and you may have pushed it over into the must try list.